If you are a lover of the culinary, dining out to sample favorite dishes are part of the lifestyle. However, this feeling adventurous hobby should be more careful when you're pregnant because you will be more susceptible to a variety of harmful microbes. Here are some tips to minimize the risk of safe foods that could potentially cause adverse effects to the pregnant woman and her fetus. 1. 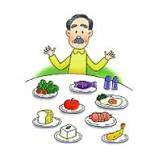 Avoid ordering raw foods such as raw seafood, the sushi, clams, oysters, shrimp, fish, and others. Raw seafood usually contain some microbes that can be harmful to the fetus. Although fish and other seafood have a nutrient important for fetal brain development, but it should be with a mature presentation. 2. If meat or chicken served medium rare, then ask the waiter to cook again until fully cooked. Harmful microbes in meat or chicken is not fully cooked to death if food is only half done, making sure food is fully cooked. 3. If ordering food that has been cooked (not cooked immediately when no order), then ask for a re-warm to eliminate bacteria that may exist during the storage period. 4. Asked the waiter about the raw material for making complementary dishes such as mayonnaise, sauces, or ice cream. Avoid if made from raw materials such as raw eggs, because it can contain harmful microbes. 5. Do not order a meal containing raw sprouts. Or order food without additional material. 6. Cheese is used for food, make sure it is pasteurized first. If unsure, ask the waiter to check the label cheese. Avoid unpasteurized milk products because it may contain harmful microbes. 7. If you order juice, make sure the fruit is washed in a state.